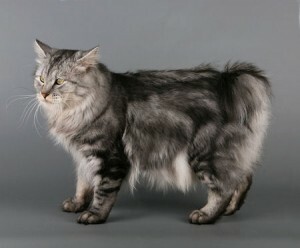 The Kurilian Bobtail is a cat with a strong stature, having a wild appearance that is in complete contrast to its gentle and playful nature. Along with its semi-cobby body structure it has a large head, broad cheekbones, triangular-shaped medium sized ears and eyes resembling a walnut, oval at the top and round below. 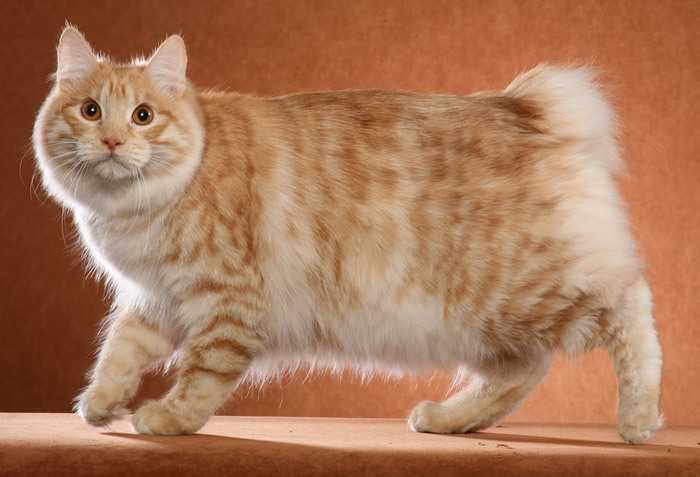 A striking feature seen in this breed is its tail, that may be in the shape of a whisk, spiral or snag, comprising of two to ten vertebrae kinked in different directions and degrees. 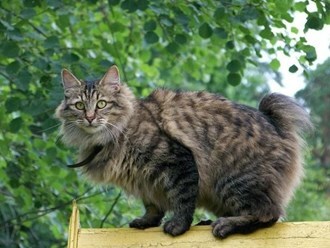 The Kurilian Bobtail originated along the Sakhalin Islands of Russia, as well as the Kuril Islands which is an archipelago comprising of about 56 islands stretching betweenRussia’s Kamchatka peninsula and Japan’s Hokkaido islands. 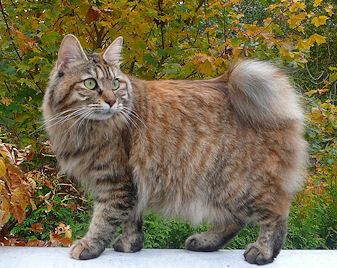 Because of their hunting instinct, these cats were domesticated in Russia also being promoted as an aboriginal breed of this country. Though popular in Europe, there are only about 100 of them in North America. 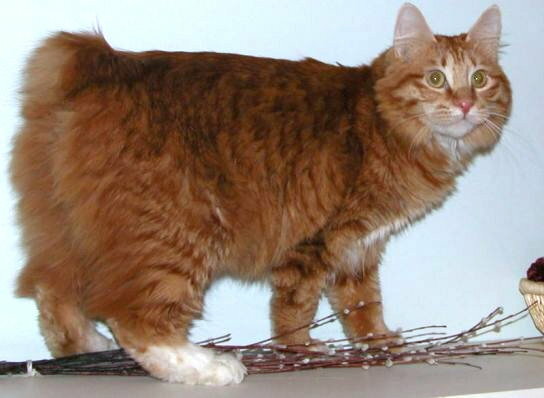 The World Cat Federation acknowledged it as a single breed in 1994. 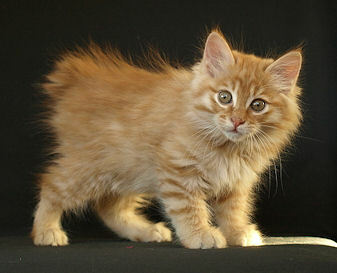 TICA (The International Cat Association) also recognized it in the Championship status category in the year 2012. 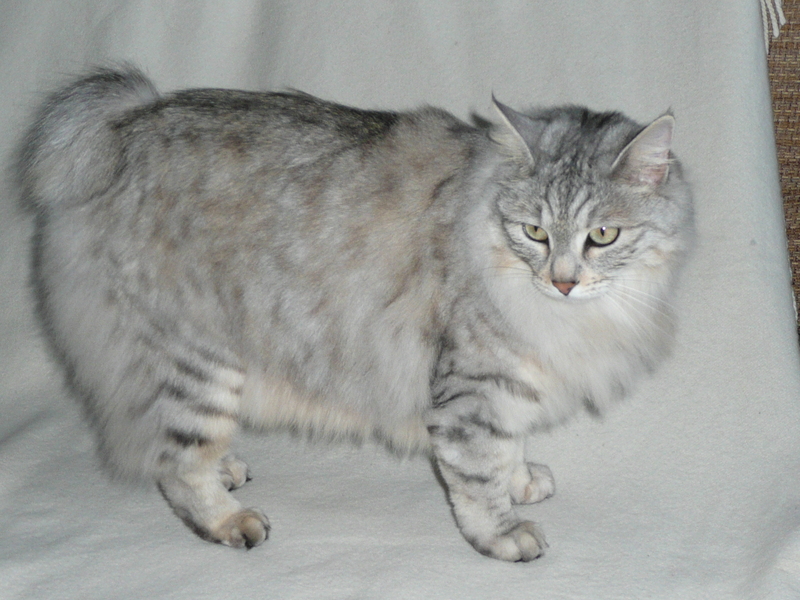 The other associations to acknowledge this breed’s status are Canadian Cat Association, Federation Internationale Feline (FIFe) and Livre Officiel des Origines Felines (LOOF). They are sociable in nature, bonding well with members of the family, cuddling on their lap or taking a nap with them at the slightest available opportunity. Being excellent jumpers, they enjoy climbing onto the highest point of your house and survey everything inquisitively from there. Owners should be careful about any glass items or valuable things kept on racks as well as book shelves. They do well in the company of children preferably above six years of age, finding a perfect playmate. They are even compatible with other pets especially dogs. These amicable cats are ready at the doorstep to greet their masters. These curious cats find ways to entertain themselves easily by playing with other pets or even on their own when their masters are not available. Their trait of adapting to any change in the environment make them a perfect choice for elderly people desiring for pets needing less care and maintenance. Owners should channelize their playful and energetic nature in a positive way by making provisions for them to work out and run around freely. You may place a cat tree at one corner of the room so that they may enjoy going high up. Certain puzzle games, as well as other interesting toys, will give them a lot of mental relaxation. As they enjoy playing in water, you can arrange for a small plastic swimming pool for them or even give bowls of water to entertain them. 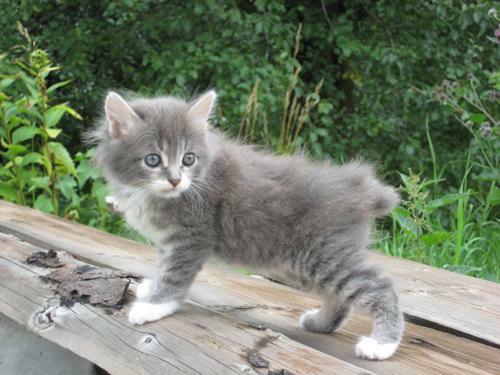 Their soft and silky coats are not prone to matting, not needing too much of grooming. However, short-haired cats need weekly brushing, whereas their semi-long-haired counterparts need to be cleaned bi-weekly. Bathe them only when required to prevent their coat from getting spoiled. They are very healthy and hardy in nature, not suffering from any known genetic or severe diseases. 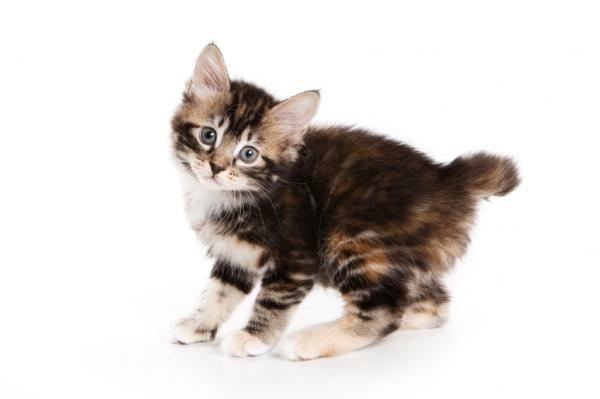 Older cats are more prone to health issues compared to kittens. Some of the common ailments suffered by them are diarrhea, feline lower urinary tract disease and eye concerns. Owing to their intelligent nature, they seem to understand what their owners want, also responding positively to voice commands, thus being easy to train. In fact, they need to be said just once about what to do and what not to do though following the same may depend on their individual temperament and mood. 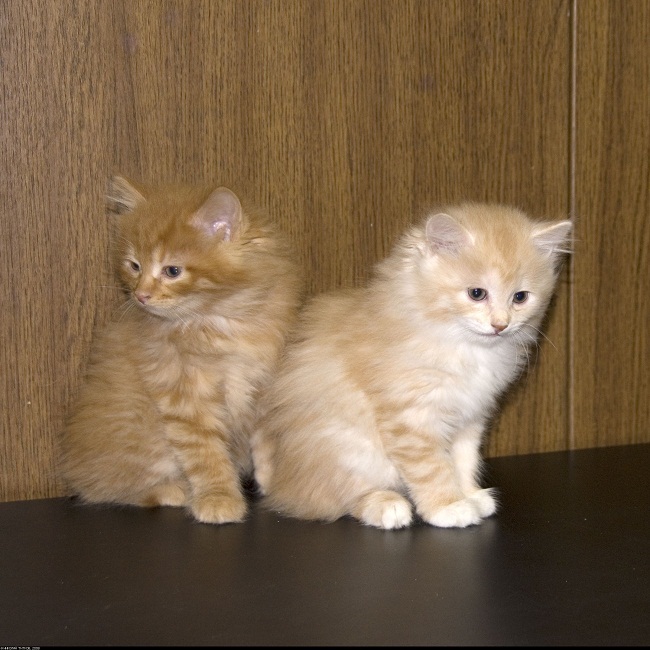 Proper socialization and obedience training imparted to the kittens will help in making their pleasant personality more soothing. 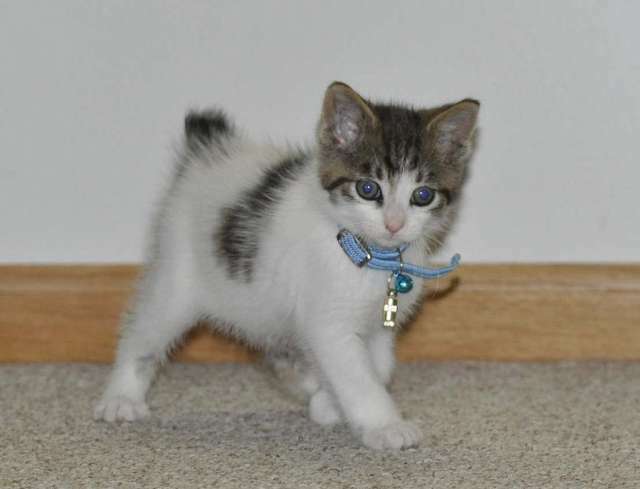 They are to be given a healthy and nutritious diet comprising of high quality dry and canned cat food along with sufficient amount of protein, vitamins, and other nutrients. Provide them fresh and clean water on a regular basis. Though not talkative, they make pleasing sounds similar to birds. The male cats are good fathers, busy tending to their young ones alongside their female counterparts. These cats are rarely available because they tend to breed at a slow pace. This breed exhibits dog-like traits in their gesture of sitting at their master’s feet. Their fondness for water is so immense that they may jump into their master’s tub to enjoy bathing with them. Published on June 17th 2015 by Maxi Gold under Japanese Cats,Natural Cats,Russian Cats. Article was last reviewed on 26th May 2017.